Rated 5 out of 5 by kandinsky from Fun In an ailing genre or two. This came out a while back, in 2010, and as other reviewers note it is quirky , campy, fun made in and of the genre of Vampire films which is sort of played out with vampires who may hardly know the taste of blood and vampire fighters whose weapons are more like props made in taiwan. Will John save Nina? Why is her family so dysfunctional? Will their love be indeed undying? Yes the mechanics of the game are those of five years ago but for me the wit and the style of the game carried me along happily clicking on everything in sight. There are online walkthroughs which are sufficient to smooth any rough spots in the flow of the game. I enjoyed this game so much more than the several recent games from the most heralded and active developers which I have played that I am thinking it is not only vampirism which can seem played out but also our own hidden object/puzzle/adventure game form which all too often seems just about played out. What can save us from endlessly recycling of game plots and tasks and images? I would say attention and creativity and that can be expressed in many ways , but here is an example of one way and , hoping against hope for better new games, I offer this with the recommendation to Enjoy! Rated 5 out of 5 by CyndiLouWho2 from Hilarious Quirky Retro Adventure!! I really think this game was intended to be a parody of all the vampire games that are so serious and creepy. And I have to admit I had trouble playing Sinister City when I first started. But after quickly figuring out the retro-feel mechanics of the game, I played it all the way through in a few hours with no trouble. If you liked the silly humor of Vampireville, you'll love this game. 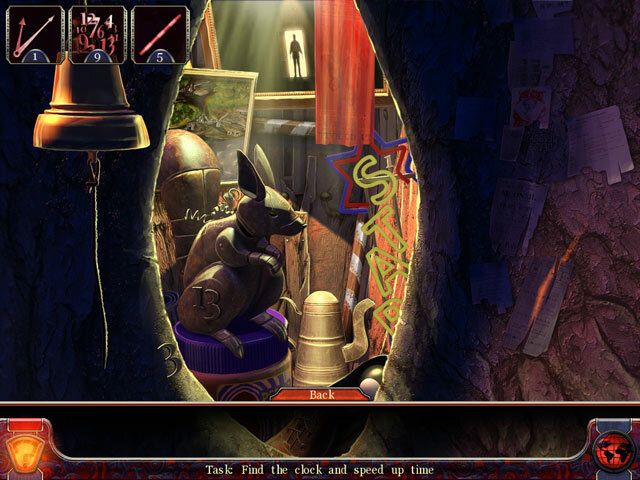 This is a lite adventure game with puzzles and items you have to find for certain characters. The dialogue exchange is quick with not a lot of reading. The voice overs and sound effects are excellent and I had to laugh at the hotel owner who sounded a lot like the comedian Norm MacDonald. This is a quick and easy game and it moved right along. There are only four locations involved, but you'll need the map to move to those locations. Hints are extremely helpful and re-charge quickly. You have a choice of playing in Easy or Advanced Mode. I played in Easy mode so I could get through the game with no frustration. Sinister City came out last year, but it plays like something from twenty years ago. If you were playing pc games back then, you will get a hoot out of this game. And be sure to watch the credits at the end of the game because they totally tie up the story line for you. The story line is amusing, the characters are fun and quirky, and I totally enjoyed playing this little gem of a game. Rated 5 out of 5 by Goldenjuju from FUN this is a great Adventure game. I love just good old fashioned adventure games. HO games are ok, but Adventure is the best. This game was so much fun to play. I highly recommend this game if you like adventure genre. Rated 5 out of 5 by game_happy from Not the usual bloodsuckers #2 LOL Like Vampireville, I've played this game several times last year. Once again, my favorites - humor, characters who move and speak. Scenes, HOs and puzzles are great from what I can actually remember. Would I play it again? Definately! Rated 4 out of 5 by Supereca from Low visual quality but funny story Games are easy but the story is surprisingly interesting with funny accents. More should be like this comic games. Well done! Rated 4 out of 5 by LunaNik from Tongue-in-cheek humor makes this "adventure lite" game thoroughly enjoyable! 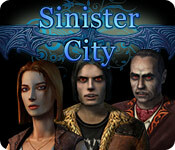 Sinister City Developed by Jet Dogs Games Review based on full game IN THE BEGINNING... 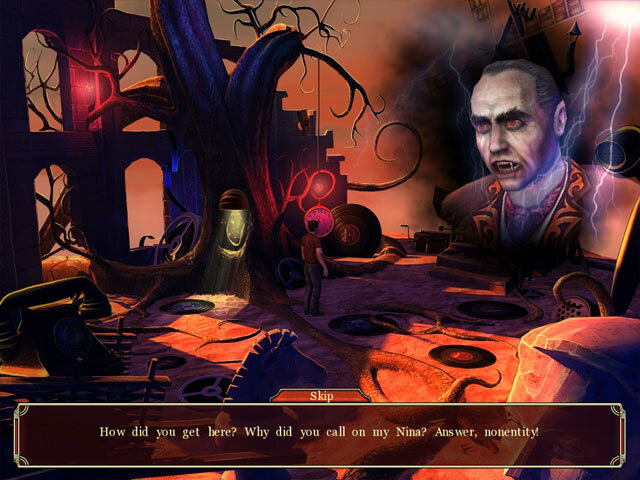 Your bride Nina has been kidnapped by the most vicious vampire in Sinister City, one Count Orlok. As a mere mortal, you'll need your wits to survive this surreal misadventure, which pokes fun at the ridiculous level to which the vampire genre has been taken of late. 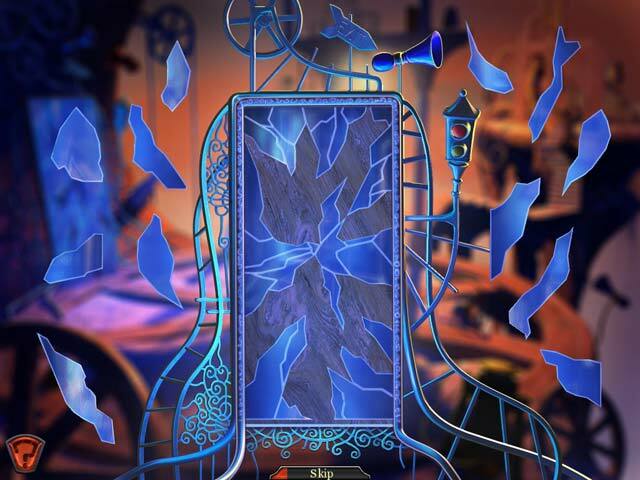 PLAY THE GAME... Sinister City is a scattered object third person puzzle adventure…er…a SCOPA, if you will. The SCO part of it generally means you'll be finding several of one type of object scattered among a few areas where you zoom in from the main area. These objects are used to repair items, satisfy NPC requests, advance the plot, etc. There are also plenty of puzzles—none difficult—including a jigsaw, pipe connection, memorize and choose the correct pattern, move tokens to match the background, etc. This is a perfect game for beginners to the adventure genre. SIGHTSEEING… Graphics are reminiscent of old-school adventure games…rendered 3D with superimposed textures. Animation includes posers and is fairly well done. SOUND WAVES… The music is well in the background and very appropriate to the game theme. Voiceovers are quite professional and add to the humor of the game. TOOLBOX… There is a map, but you don't access it. Instead, you're taken to it when it's time to move to a different location (sort of Indiana Jones style). The hint button tells you exactly what to do next (and gives you directions for the puzzles). THE LAST WORD… While Sinister City is quite short, less than 2 hours, I rather enjoyed it for the humor and because I love adventure games. I definitely recommend it as a DD or if you have a PCC. Be sure to watch the credits! Rated 4 out of 5 by Barbayat from Humorous Scattered Object Game It is a very simple game where you have to find mostly the same type of objects in a scene to get to an new dialogue or scene. It is not your typical "rescue your girlfriend from the fiendish vampire" story - but a rather silly take on the current sad state of the vampire genre. I thought the references and hidden complaints were quite intelligent - but if you are not a genre buff or share the same kind of weird humour you might just find this game and story incredibly silly and dumb. The characters you encounter are a combination of walking stereotypes - so beware if you don't like that sort of humour. The worst mistake you can make when buying this game is to expect something scary or sinister: After all this games features a vampiric version of the teletubbies which is something some might find very terrifiying. I really had fun playing this game, despite its short comings and the ending (during the credits) was incredibly funny and rewarding for all the tedious searching for objects. Rated 3 out of 5 by mrm2006 from Vampires in Sinister City??? Say it Ain't So! This is definitely the strangest game I've ever played. And, yet, it DID have some ...... intriguing parts. lol Apparently, your character, a young man, has gone to get a hotel room outside Sinister City, where he has heard that his bride has been taken. The hotel clerk, before offering him even a room for the night, has him doing all sorts of errands, quests, what-have-you. Including, if you can really believe it, finding parts for the hypnosis machine that will take him to another astral realm where he will find his true love. HAH! Strangely enough, the young man is NOT surprised one ... little .... bit that he was just told the oldest and most powerful VAMPIRE in Sinister City's daughter is your true love. OR that the hotel clerk is the oldest living VAMPIRE HUNTER! Where was all THIS info in the game description. Graphics. How can I explain. For the GAME itself, graphics were ok. Music was a bit ..... strange and twangy. Voice overs did NOT match the lip syncing at all which made it very disconcerting to watch. No real sound effects. There are 2 levels of difficulty - casual and advanced. Everything you have in "casual" is removed in "advanced". But, if the "casual" I played was any indication, THAT mode of difficulty will be challenge enough even for the most experienced player. There was mention of a map, but I never did get even close to getting it. There was just soooooo much to do beforehand. Find me this, do that for me, go here, go there. It NEVER ended and it generally didn't add anything to the game play. No journal/diary. The hint button took forever and 10 months of Sundays to recharge. Which isn't so good since you have to use it quite a bit as the game has no sense of direction ..... at all. So, either you walk around a LOT or you just sit and twiddle your thumbs, play with the dog, take a nap, have a cup of coffee or take a bathroom break while reading the current best seller. By the time you've finished ALL THAT - the hint button SHOULD be recharged. Needless to say, there is absolutely NO direction here. No sparkles unless you happen to click on where they are supposed to be, such as a closet. If your cursor turns red, GO THERE! It's a HOG area! I figured that out myself - ahem ahem. HOGs - Once you find them (they do not sparkle or yell "boo") you have to click on EVERYTHING because the items you really need and are looking for (pieces of a mirror or a clock that you have to repair, etc.) are also hidden in the various HOGs and are never quite in sight. As are some of the HOG items you are looking for NOT in plain sight - but they do not appear asdifferent colored words. And, you don't get to really LOOK into the closet, etc. for a "zoom" look to find these things. You kind of are on the outside looking in from ... afar so things can be a tad .... on the tiny side. So, basically, point and click at ...... EVERYTHING! And, the main items you are looking for (pieces of a mirror, etc.) are scattered in several HOG areas, not just in one. You need a map. You need a guide. You need ... oh forget it ..... the hotel clerk would probably send you out to look for it anyway. The mini games are fun and relatively easy. HOGs outweigh the mini game ratio by a LOT. Oh, yes, there are NO instructions for the mini games, but there IS a "skip" button. Go figure. I love a game that has no hand-holding and very few instructions. I like the challenge and have purchased a game before that had a major glitch ---- there were no instructions or clues or sparkles. I LOVED IT! This game, however, being so different from today's HOGs, needs "some" instruction. Also, less hokeyness and more intelligent conversation. This just isn't a purchase for me. Oh, don't get me wrong. It MIGHT have been ..... if not for that "hint" button recharge time. I will definitely recommend everyone I know try the demo. I want to hear what they did while waiting for the hint button to recharge. ENJOY! Rated 3 out of 5 by Pearly11 from Not for everybody's taste... but I quite like it. I played nearly to the end of the 60 minute demo and thought I leave a few minutes outstanding as flag that I might it. The game is a bit surreal, somewhat in the range of Green Moon and there were moments when I had to laugh. E.g. when John as the main character describes the crime scene from which his girlfriend was kidnapped and said with the mos serious of faces: "Bats droppings were found" :-). The music, which is not intrusive, adds to the surreal feeling of the game and I really think that this one is a little gem. So if you like Green Moon give this one a go. Rated 3 out of 5 by donley39 from Terrible Story line and easy game play. This game is just terrible. The developers had all the right ideas but it just came together wrong. To many things going on?? The beginning doesn't match the ending. The HO games were easy and the graphics were tacky. I appreciate that there is an ending because most games skimp on this attribute.